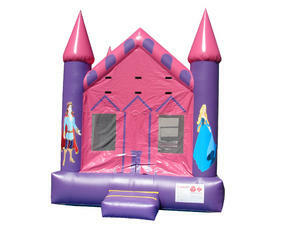 This beautiful Princess Castle bouncer can make any girls dream of having a princess party come true. The vibrant purple and pink colors make this princess bounce house exclusively for her majesty. Out front there's an inflatable safety ramp to protect excited kids and they scramble to get inside, and all around there are large netted vented windows that keep things cool inside for the kids, while allowing parents to keep a watchful eye on all activities.